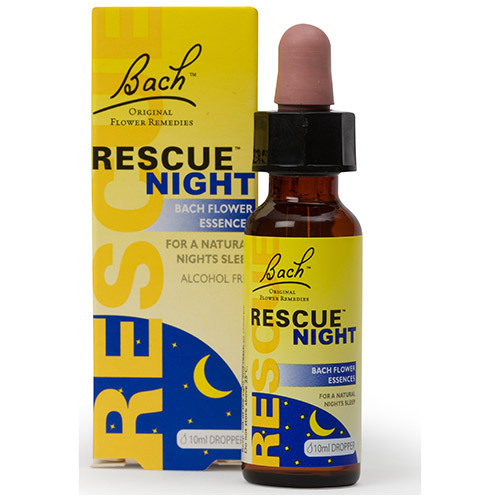 RESCUE NIGHT® combines the five original flower essences discovered by Dr. Bach plus the Bach essence White Chestnut, which has been used to help switch off the mind from unwanted repetitive thoughts. These flower essences combine to help you enjoy a natural night`s sleep. Glycerine, Water and flower essences (Helianthemum nummularium, Clematis vitalba, Impatiens glandulifera, Prunus cerasifera, Ornithogalum umbellatum [RESCUE®] and Aesculus hippocastanum). Put 4 drops directly on the tongue. Alternatively 4 drops into a glass of water and sip at intervals. If seal is broken, do not use. Below are reviews of Bach RESCUE NIGHT Drops - 10ml by bodykind customers. If you have tried this product we'd love to hear what you think so please leave a review. It normally takes me hours to settle and get to sleep, but when I put a couple of these drops on my tongue just before getting into bed I am asleep with 10-15 mins. I don't know how it works - but it just does!